Professor Xenophon Moussas will present a lecture about the Antikythera Mechanism, on Monday 20 March 2017, 6.30pm, at the Greek centre, as part of the Greek History and Culture Seminars offered by the Greek Community of Melbourne. The Antikythera Mechanism is the oldest known computer, even originally named tablet in Greek (PINAKIDION, little table, i.e. tablet), a realistic clockwork Cosmos, a Planetarium, most probably an astronomical clock. Made during the 2nd century BC somewhere in the Greek world. It has been found by sponge divers from Syme, in a huge shipwreck of the 1st century BC in the island of Antikythera. It was a floating museum probably larger than 50 m full of Greek treasures transported to Rome. It works with carefully designed bronze gears that perform appropriate mathematical operations to predict astronomical phenomena. It displays the position of the Sun and the Moon in a map of the sky, the phase of the Moon, the time of solar and lunar eclipses and the places these are visible on Earth. It probably worked like a cuckoo clock, with a system of weights and counterweights and a water clock as regulator. At the lecture will be discussed the most basic question, on how humans conceived, designed and constructed a mechanical Cosmos. The Antikythera Mechanism is the epitome, of the Philosophy of Greeks, the Natural Philosophy of the Greek philosophers, namely the Ionian philosophers and the Pythagoreans. To conceive the construction of such a clockwork universe a civilization must have developed: a) the notion of determinism, b) that there the laws of nature, c) that the laws of nature are expressed with precision only with appropriate mathematics, d) that natural phenomena are understood and interpreted with the laws of physics, e) and sometimes predicted by the laws of nature. These results are based on the 12 year research of Professor Xenophon Moussas team and especially on the latest readings and interpretations of the manual of this ancient Greek computer. 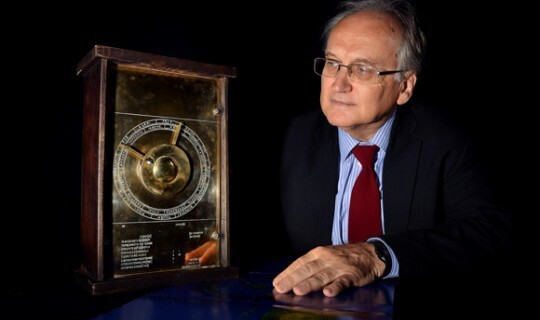 Professor Xenophon Moussas (University of Athens) is one of the protagonists of the study of the oldest known computer and clockwork cosmos of the 2nd century BC, the Antikythera Mechanism. A space physicist, with research interests including space and solar physics, planetology, Ulysses mission, WIND/WAVES and STEREO space mission, Solar Orbiter. He has supervised 25 PhDs. Awards include: NASA group achievement, Ulysses Mission, 2009, Geophysical Research Letters excellence in refereeing, American Geophysical Union2001, Hipparchus award, Arcadia, Athens, 2010. Created exhibitions about the Antikythera Mechanism around the world.